Prickly and Bitter: Will this plant really repel mosquitos? Lemon grass (or lemongrass. Same thing) is native to southeast Asia, which should be intuitive for those that cook international cuisine (or local cuisine, I guess, if you're in Thailand or the Philippines!) since it is heavily used in Thai and Filipino dishes. If you've never seen the full plant before (as opposed to just the bulbous bottom of the stalk in the grocery store like in the third photo), you'll notice it looks a whole lot like ornamental grasses you might grow in your garden if you live in temperate North America, like zebra grass (which you can read all about HERE). This species of plant, while not in the same genus as zebra grass, is a close relative and in the grass family. 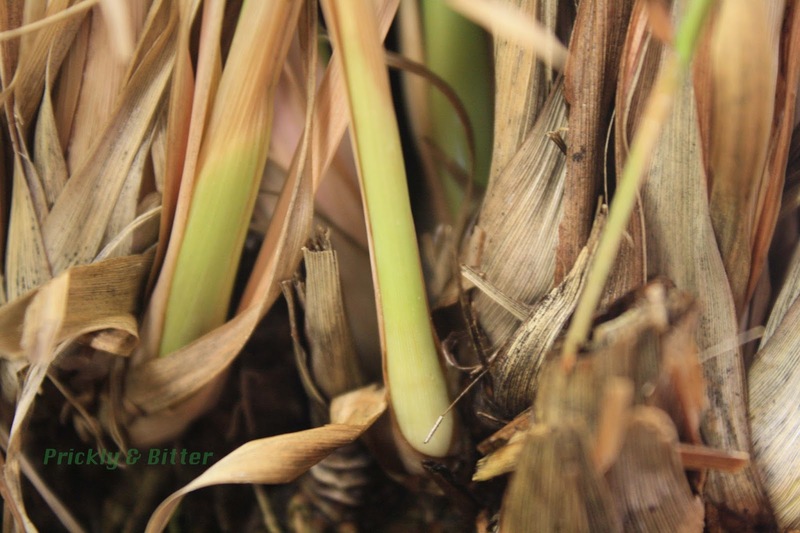 Like ginger (profiled a few days ago in a blog entry that you can read HERE), lemon grass has a ligule that is useful in identification of the species. 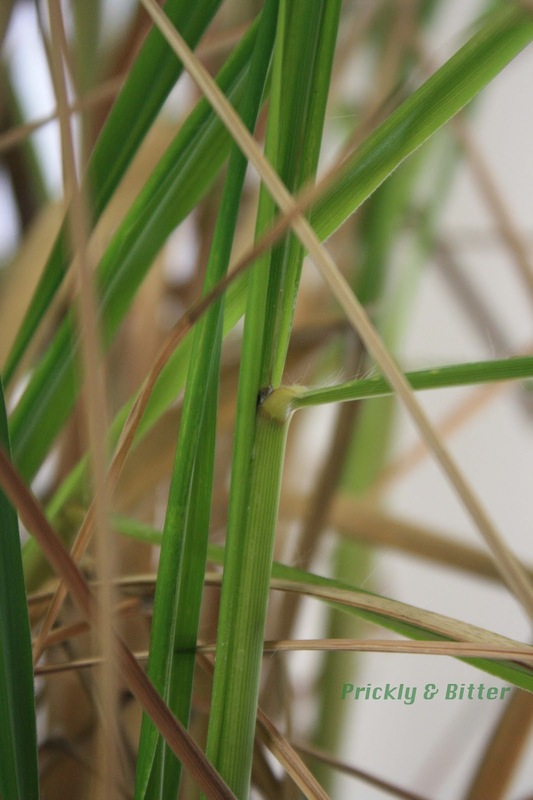 It is a very unusual ligule in that there are long hair-like appendages that protrude out of the base of the blade of each leaf, and the papery part of the ligule is short and has nearly a straight edge (which is unusual for a ligule; usually they're longer in the middle than they are on either side and somewhat semi-circular shaped). It's a pretty characteristic ligule, and I'm ashamed to say I didn't get a great picture of it when I had the chance. I'll have to go track down this plant in the greenhouse and make sure I get a good picture of it! Like other grass plants, but unlike ginger, lemon grass has very non-descript flowers that are pollinated by the wind (and that is actually a photo of the flowers in the fourth photograph). This is a characteristic of nearly all species in the grass family, where the amount of resources necessary to allocate to a "pretty" flower used to attract insects or small animals (like hummingbirds or even mice) is far more than it is just to give way to the wind and rely on having your pollen blown from plant to plant. This is partly attributed to the habitat in which most grasses live; wind is abundant in prairie habitats and cheap to use. If you rely on living pollinators to cross-pollinate your flowers, you may run the risk one day of having pollen ready before there are pollinators around to transport it for you. 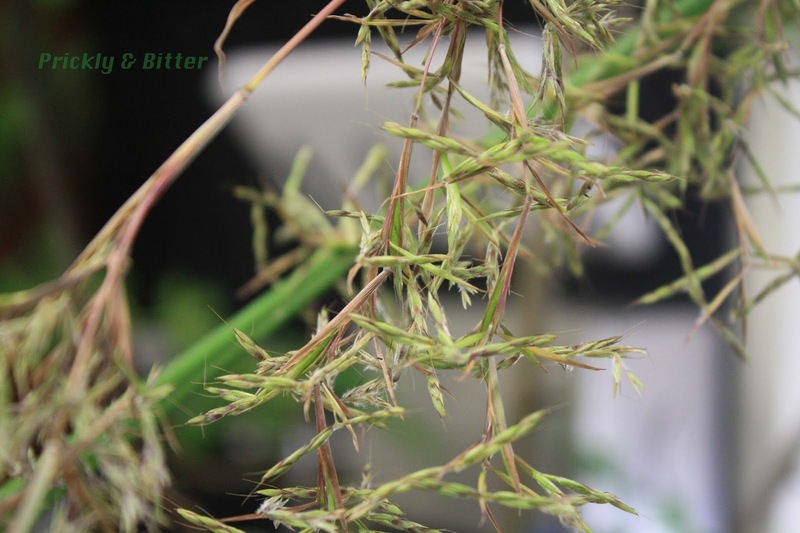 Grasses have evolved "simplified" flowers to eliminate this risk and maximize the potential for pollination. Smart grasses! As well as the great citrusy flavour lemon grass imparts on food and beverages, lemon grass has been used in folk medicine around the world for centuries. In Brazil it is believed to by an anxiolytic and hypnotic plant, but anyone who has ever had Thai food or lemon grass tea could probably speak to the lack of both of these effects, even when the plant is consumed in large quantities or consumed in a more concentrated form like chewing the stem. In fact, no scientific studies have ever substantiated this claim. Lab studies, however, have shown that this plant has the potential to show some medicinal value. It does show cytoprotective and antioxidant properties, suggesting that this may somehow one day play a role in cancer prevention (no known method of exploiting antioxidants to either prevent aging or prevent the development of age-related cancers currently exists, no matter what anyone tells you). One of the chemicals in the extracted essential oils of lemon grass has been suggested to play a role as an antihypertensive, and in lab studies the pure form, called citronellol, has been shown to lower blood pressure in mice and rats so there is definitely the potential to use this chemical as a potential blood pressure herbal medicine. 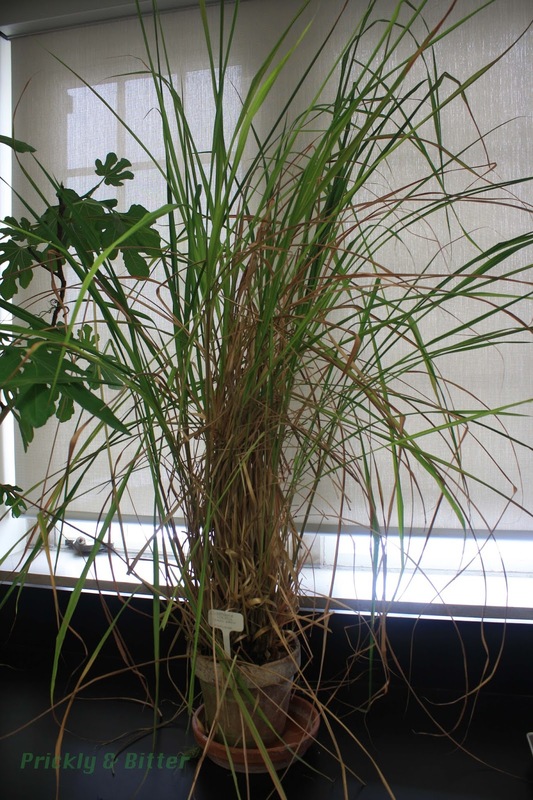 There have been very few reports of this plant being toxic to any kind of domestic animal (human or non-human pets), so you don't have to worry much if you grow your own lemon grass. Cats anyway will stay away from it because it smells like citrus; unless you've got an atypical cat, cats hate any kind of citrus. Lemon grass oil has been reported to cause mild skin rashes in people with sensitive skin, so if you have extremely sensitive skin be careful handling the fresh-cut plant. Does this mean citronella NEVER works against deterring bugs? No, it doesn't mean that. Remember that essential oils produced by plants are secondary compounds usually used in plant defence? Well, it smells like lemons for a reason. Citronella IS actually an effective insect repellant; clinical studies have shown that it is nearly 100% effective in deterring fruit flies from a specific area where it is applied, and it doesn't have to be applied in large quantities. It also does a pretty effective job of deterring stable flies, which bite not only humans but also horses and cows if they get a chance (and these bites are incredibly painful, bloody, and result in enormous welts on the skin). Citronella oil definitely does have a good use in insect deterrence, just don't expect it to do anything for mosquitos!